The first glance at this fierce Night Elf tells a lot about her character. From her perpetually tall and confident stance she is every bit the confident and powerful Sentinel that she looks to be. Athletic and powerful, Celleris' body is honed to that of a weaponlike state comparable to the weapons she wields. Where she leaves her flesh visible layers of sinew and tightly layered muscle suppley sit beneath the silvery skin, power and agility in equal measure the hallmarks of this proud and athletic Night Elf. With her skin a healthy but pale tone and her eyes ablaze with an Elunite glow somewhat stronger than many of her counterparts it is clear that Celeris is very much nocturnal, a ghostly look about her akin to the fairy tales that superstitious humans would tell to their children back before the formation of the Alliance. This wispy look is reinforced by the long and messy tangle of strong but soft hair that she pins behind her in a long but practical tail, and cresting each of her eyes to scar her forehead and cheeks are the bold and dark tattoos of a distinctly tribal and warlike Night Elf. Overall there is a look of otherworldly strength and beauty to Celeris, one that may seem intimidating and forceful to some, but elegant and sculpted to others. Much like the spear, bow, and scimitars that she so often carries. 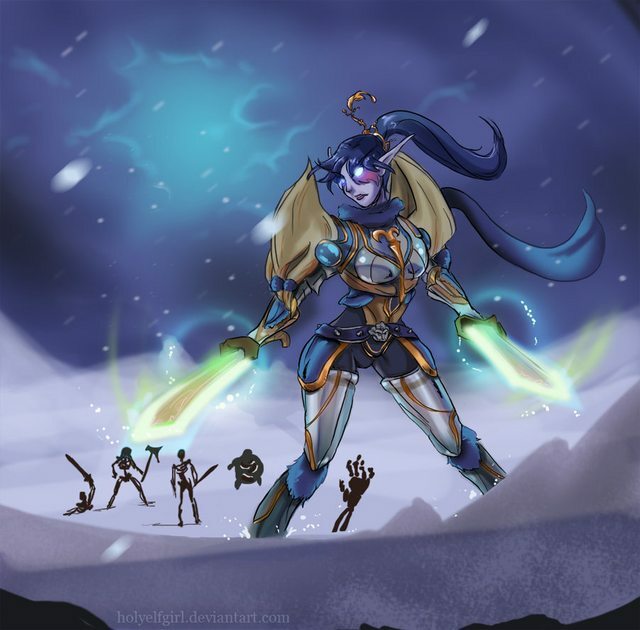 The tl;dr of that is that Celleris is very much a 'looks the part' Night Elf fighter. She is somewhat cold and ethereal in the way one would expect from a Night Elf who didn't interact much with the outside world, though her experiences in Northrend have made her more sociable - if occasionally odd. Being surrounded at all times by famine and undeath has given Celleris a certain appreciation of her own life, and while she still yearns to protect her people she'd far rather be able to enjoy herself (and stay WARM) at the same time too. Reason to join: We have a problem in the Sisterhood at the moment, I'd put it down to Night Elves being bred out by the influx of long-donged Draenei trotting around but the guild hasn't been around long enough for that! I feel it is a question of activity, we don't really have that many Draenei but the Draenei we do have are fun and active people both here and on the forums while many of our Night Elves lurk away shadowmelded in the depths of the guild roster. I love this guild, and I love playing Aennae within it, but when I go to combat events on Daialeerolai I can't help but feel that I am contributing to the problem, so I'd like to present Celleris! Celleris is a fun and energetic character to play, fairly easy to interact with and easy to put into a variety of situations, making her able to attend a larger number of events than Aennae or Daia. I feel she would be a great fit for the guild and also a great fit for me, I don't like having to tell myself "Okay, I -could- go here because I want to, but I would be sacrificing my storywriting integrity if I were to put my character in this position because there is no legitimate reason they'd go there" and given Celleris' love of combat and challenge I expect myself to have to say this far less. She can go to Draenor, she can go to Blade's Edge Mountains, and unlike the other two she's more likely to drink a suspicious potion. Have you read and agreed on Conduct Requirements? : Yup. Honestly expecting to see her in the guild, looking forward to meeting another of your interesting characters! Good, now thats the way to see and help things out that should be appriciated. I have only one thing to say on this, yes please. Aen rp style + more sentinels = Please, dont make me beg for it. Just you wait, after a few weeks the zipper on Celleris' back will descend and it will turn out to be three gnomes stand on each others' shoulders in a cunning disguise. So Celleris is confirmed to be a spooky ghost then? You didn't have to make another application to join with your nelf female alt, but you are free to do so of course! Great description, and I really love the art too.